Brrr… It’s cold over here. That’s mostly because I just finished drinking more chocolate milk (with ice in it because I like it extra cold). We made maple chocolate syrup last night and it is wonderful. Thanks for the milk, lady. I asked Noah to get me a blanket, but Isaac eagerly brought me one instead. They are sweet boys. Isaac also brought me a pillow… I wish buddy. I can’t wait for nap time! We sold our car recently, which is wonderful. We spent some of it on a fun homesteading investment (I’ll tell you about that in a second), but then some went to oil. It’s been a long, rough winter on the oil bill. There were so many extreme colds. We have a plan for oil, but it is for a ‘regular’ year. And this was not a regular year. It ended up being perfect timing for the car sale. We’ve looked into adding a wood stove so that we can source our own heating fuel. Maybe cut down and split some free wood. But we still have to think about how to get some heat under the house so the pipes don’t freeze. If it turns into a major project, it probably won’t happen. We’d really like to reduce our dependence on oil and things that generate expensive bills like that. It was also perfect timing for our really cool homesteading purchase. We met a fun couple and they gave us a really good deal on a really cool tractor. We now have a David Bradley walk behind tractor with snow blower (plus wheel chains and weights), disc harrow, plow, and sickle bar mower. It needs a little fine tuning, but I’m thankful Joel can do that. $375 for these types of tools is pretty awesome! We wanted to buy a snow blower before next year, so this is a really neat find. We first started thinking about a walk behind tractor after hearing about the book “The Market Gardener”. This book is really remarkable, and we are going to use it to inspire our garden this year. The author sites some Elliott Coleman ideas, which was a plus to me since it was somewhat familiar. The author shares how he and his wife have successfully market gardened small scale and with minimal investments. The couple started market gardening on 1/5 acre of rented land. They made $20,000 the first year and $55,000 the next year on the same spot. They don’t use large expensive tractors and didn’t even start with a walk behind tractor. I found that their style of “tilling” (virtually no-till) and working the land is very similar to what we started to be persuaded towards from Born Again Dirt and several other gardeners. They now intensively garden (and live) on 1 ½ acres of bought land and bring in $140,000 a year. Very cool! We don’t plan to turn this whole acre into garden because we still want to provide our own dairy, beef, poultry, and eggs, but we could carve out a pretty good sized garden, use the composted manure from the cows as the fertilizer, and sell excess produce each summer. Wouldn’t that be fantastic? I’m dreaming, but I think we need to go all out on this… I say that now. 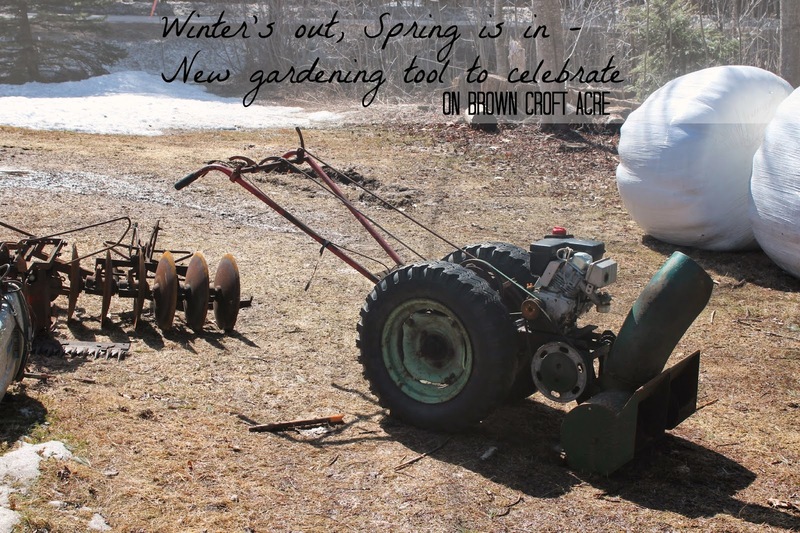 We are essentially weekend gardeners, so mulching and creative gardening will be a necessity. There are a few manual tools that I had never heard of that we will be searching out. We really need a broadfork to make this method work. The idea is that we pick tools that don’t really mix the soil. They just loosen the soil each year. We’ll also be picking preparation tools that are generally the same width as the raised bed we’ve created. An illustration of a broadfork in "The Market Gardener"
We are planning to use the chickens to intensively clear some garden space of grass (like the chicken tunnel man here). That way there won’t be clumps of sod. They’ll also leave some manure. Recommendations are to wait 90-120 days to harvest crops after applying fresh chicken manure, so we’ll have to keep that in mind and get them to work really soon. Then we’ll use the plow to break the ground. Then the harrow. A few other hand tools. Then we’ll shovel out the paths and add the path soil to build up 30 inch wide garden beds about 8 inches tall. We’ll also add some layers of compost and composted manure, and whatever else we think we need to “fix” the soil. Maybe some lasagna gardening in there (like the Homestead Honey explains here). I’m thinking we’ll lay down straw and scrap hay in the paths to decompose and keep us from having to weed that area. Wood chips for the garden bed (I think I know where to get these for free) or intensive planting that will shade the bed at ¾ maturity and reduce weeds. The sickle bar mower will be handy if the grass grows faster than our cows (or cow… oh, Norway) can chop it down. We are hoping to do some hand bales of grass hay and straw if we grow any grain. That’s a lot of excitement! Our garden plan keeps evolving, but it seems to be getting better and better with each refinement. The snow is disappearing and it’s looking like we might actually get to have a garden this year. So I guess that’s what’s been going on the past few weeks. More reading, research, and thinking. Michelle Brown is a participant in the Amazon Services LLC Associates Program, an affiliate advertising program designed to provide a means for sites to earn advertising fees by advertising and linking to amazon.com. Your new purchase is so exciting!! I wish we had room for a garden. This year I plan to start my own herb garden for the girls so they can have the tools to be healthy ladies. I give them garlic, basil and oregano on a regular basis and also cilantro. I also put Briggs Raw Vinegar in their drinking water which is great for them, never mind how clean it keeps the waterer. All very good for them in various ways. No new pictures of Butterbean? Just hoping that everything is okay with him. Mom and Dad told me you were walking them about the other day on leads, I think that's wonderful. That sounds really neat! I haven't even used herbs for my chickens yet. I'll have to do that! that would be very pretty around a coop. I'll probably post about him in a day or two. :-) He's doing great! That's awesome! I had heard of heat tape, but didn't really know what it was. Thanks for the link! This is all exciting news! Congrats on your new purchase and the decisions you guys are making about the land :) It sounds very wise, and sounds like it financially will pay off for all the hard work. Can't wait to hear more about it! Thanks! We are hoping it will all be financially sound. We try to make every part of our homestead financially sustainable on its own. Nothing brings in enough money, or saves enough money to justify having something that doesn't make or save. That garden tool better pay for itself with our garden bounty this summer. :-) If not, I'm sure it's usefulness will pay for itself in only a year (with snow blowing and all!). Oh. My. It’s a latte. Our Homestead Schedule for 2014 - because we don't want to fall behind! We said goodbye to what started our homestead - "Henny" and "Penny"